​Brooklyn & Boyle, nearing its fourth year of publication, is extremely pleased and proud to bring back a tradition we began in 2009, our annual Ruben Salazar memorial tribute issue. It is a tradition born in the marriage between creative cultural expression and the legacy of journalism bequeathed to us by an outspoken leader who, sadly, we lost during the upheavals of the Chicano Moratorium season, a season of hope and struggle that lasted, say some, from 1969 - 1971. For us, freedom of expression, the right to a free and independent press and the proud spotlight we focus monthly on the artistic accomplishments in our community have all gone hand-in-hand. We are proud of our recent July issue and have received numerous compliments, both on the caliber and quality of the writing as well as on the presentation and design. We could never even dream of looking so good if it weren't for the many brilliant visual artists whose work as graced our front page over the few years we've existed. Our very first Ruben Salazar tribute issue cover featured a portrait of Salazar by our very own Barrio Dandy, John Carlos de Luna, whose work we have long admired. In fact, John Carlos is the only artist on the entire East Side, a born-and-bred son of Boyle Heights, who has contributed more than one cover. Our second Ruben Salazar cover was created by J. Michael Walker, an honorary Chicano/Mexicano if there ever was one. His portrait of Salazar with a falcon on his arm rendered in prismacolor spoke to our collective regard for the popular LA Times journalist who galvanized so many with his powerful articles, columns, essays and television reportage. 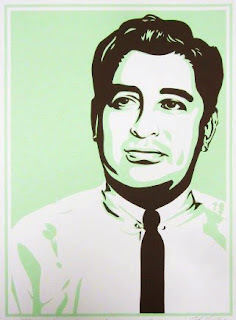 For this, our third Salazar tribute issue, we are blessed to present a portrait by Ernesto Yerena Montejano produced by his Hecho Con Ganas initiative in conjunction with Richard Duardo and the Duardo-led Modern Multiples print studio. We invite you to become part of celebrating a free speech champion and a heroic figure in the Chicano movement, which now finds a new generation of dreamers donning the mantle of change makers, young people and students who are discovering in the history of individuals such a Salazar, their own voices. Reach us on FB, Twitter, or by email at brooklynandboyle@gmail.com to hear how you can support truly independent arts, culture and community journalism on LA's Greater East Side. We look forward to sharing more with all of you, both in and outside of the Los Angeles metropolitan area, as we reach more and more readers across the state and, yes, even the southwest.